Improvise, Adapt, and Innovate in an Ever Changing World! Bigger Sales Through Better Service: Create a “Yes, And” Experience! Creativity Training Program for Business: Try Improv Comedy! Have you ever felt like it would benefit your team, department, or organization to be more creative? 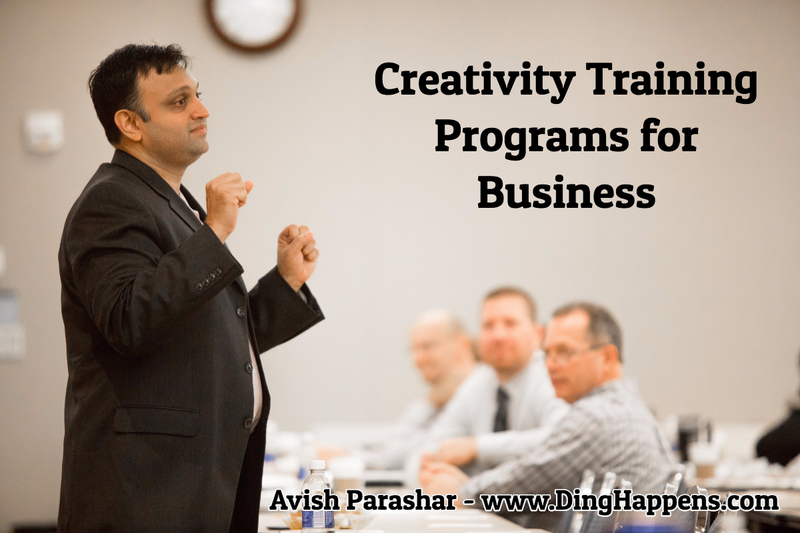 If so, you may have considered a creativity training program for your business. Creativity training is exactly what it sounds like: training your employees in a way that shows them how to access, develop, and apply their creativity. My definition of creativity training involves all three steps; how employees can access their own creativity, how they can further develop their creativity, and how they can apply their creativity to their work. Access: All people are creative. However, as people grow up they tend to block their creativity. The first step in any creativity training program is showing people how to get past those blocks and access their inherent creativity. Develop: Creativity is like a muscle. It’s not a switch that can just be turned on and off. Once it is accessed, it needs to be built up over time. A creativity training program needs to show you how to continuously develop those skills. Apply: Being more creative in general will probably yield some results, but they will be accidental. A good, true creativity training program should show your team not just how to become more creative, but how they can specifically apply that creativity in their work and in their day-to-day activities. It is very important for a creativity training program to contain all three steps because when you miss one or two of them, as many programs do, the result is far fewer benefits. Improved problem solving: The more creative you and your team are, the more solutions you’ll be able to find to the problems that arise. Staying competitive: The world is changing very fast. Organizations that keep doing things the same old way will fall behind. Improving your organizational creativity will help you and your team not only stay competitive, but also move ahead of the competition. Employee morale and retention: Employees become the most engaged when they are allowed to express themselves. When they are generating and acting on their own ideas, they have a sense of ownership, involvement, and accountability. This leads to autonomy, which leads to greater morale and improved retention. Even though you have considered a creativity training program, you may not have considered using improv comedy as the vehicle to conduct those creativity training programs. Creativity or innovation training is important, and improv comedy is a great way to implement those. The quality of the creativity training exercises. Instructors, regardless of methodology, come in all forms. Some are good, some are not so good. You need to vet them in each individual case. However, quality creativity training exercises are critical. Creativity cannot be “explained” to people. Creativity is a skill, and it is a skill that needs to be practiced. In the same way, you can’t just explain to someone how to do a great tennis serve. You have to actually get them on the tennis court hitting some balls so they can practice and develop the skill. Any creativity training program needs great creativity training exercises for it to be effective. This is where improv comedy becomes hugely beneficial. If you’ve been in the corporate world for any amount of time, you’ve been to training sessions. They are often met with low energy, low expectations, and a certain amount of dread. When we shift to improv comedy and add our creativity training games, we take away some of that dread and we change the focus from needing to learn corporate skills to simply having fun and playing games. Since the art form of improv comedy is so much fun, your participants actually enjoy the training, instead of being brain-dead. It’s interactive. Again, people need to practice the creativity skills to get better. An improv comedy workshop has participants playing improv games throughout, so it is incredibly interactive. It’s subtle. You may not normally think of the word “subtle” when it comes to improv comedy. But the reason I say “subtle” is that when you are teaching someone an improv game, you are approaching their business skills from a side door. Instead of directly hitting them over the head, which leads to some resistance and people saying, “I don’t need to learn that,” you are simply showing them how to do improv, which teaches them the creativity skills in a subtler way. This helps them learn the skill without the pressure of thinking of the immediate business application. When done right, it leads to great improv comedy applications. Yes, it is fun, it is interactive, and it teaches creativity through the side door, but a good improv comedy workshop will then make the connections for the group into how they can apply this to their business. The creativity training program must have a purpose. It’s not just improv for improv’s sake. Improv is fun and people leave happy, but there needs to be a business benefit. Your creativity training program using improv comedy needs to ensure that people experience the right things with the skill. That is, an improv comedy game can be played in a variety of ways. You need to make sure the instructor is using the right games and teaching the right skills that are going to benefit your group. Also, your attendees need to know how to keep developing these skills. As we said, creativity is a muscle. You can’t just come to one workshop and suddenly be creative, so they need to leave with ideas, exercises, and tools to help them keep developing. They need to have ideas on how to apply the skills to their jobs right away. Even though some of these things take a long time to develop, you can apply some of these skills right away if you are given the right techniques and tools. These should all come out in the game debriefs. A good creativity training program using improv will not just be improv games, but will have quality debrief sessions after the exercises to address all these issues so attendees, in addition to having fun, get tremendous value. What’s the next step? If you’re interested in using improv comedy for a creativity training program, watch some of the videos on this site. There are many games there, and you can adopt several of them very simply, even without needing improv experience or instruction. However, if you’d like to go further in depth, contact Avish now to discuss how his improv comedy training program will help you and your team or organization improve their creativity and increase their innovation. 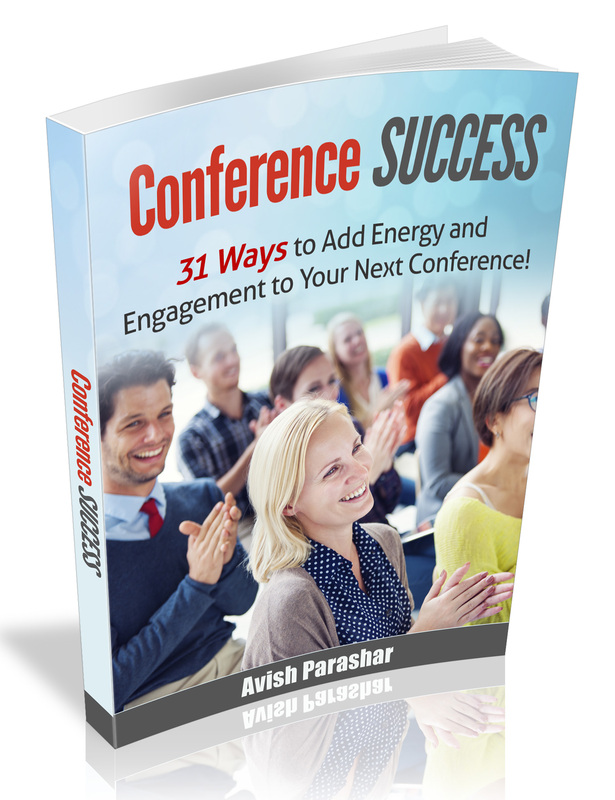 Download this Free PDF with 31 ways you can add energy and engagement to your next conference! Finding Opportunities in "Ding Moments"
You Can’t Innovate by Tweaking! Change Management Keynote Speaker: Ding Moments are Your Chance to Shine! Planning an Event? Want to make it memorable? This PDF Report shares 31 ways you can add energy and engagement to your next conference or event! to Get Access to Your Free Report!